XM SATELLITE RADIO is 100 channels of digital quality sound that goes wherever you go -coast to coast. GM maintains exclusivity forn factory installed satellite radio for 2003 model year. Delivers 18 Highway MPG and 14 City MPG! 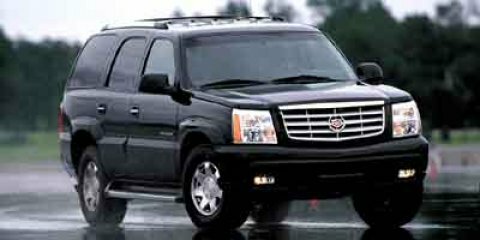 This Cadillac Escalade delivers a Gas V8 5.3L/325 engine powering this Automatic transmission. XM SATELLITE RADIO is 100 channels of digital quality sound that goes wherever you go -coast to coast. GM maintains exclusivity forn factory installed satellite radio for 2003 model year., WHEELS, 4 - 17" x 7" (43.2 cm x 17.8 cm) 7-SPOKE CHROME ALUMINUM -inc: 16" (40.6 cm) spare, TRAILERING EQUIPMENT, HEAVY-DUTY -inc: trailering hitch platform & 7-wire harness & connector. * This Cadillac Escalade Features the Following Options *SEATS, MIDDLE LEATHER SEATING SURFACES BUCKETS, RECLINING W/HEATED CUSHIONS (2 SETTINGS) & FOLD-DOWN ARMRESTS, NUANCE LEATHER SEATING SURFACES (STD), ENTERTAINMENT SYSTEM, REAR SEAT -inc: DVD player w/remote control, overhead display, 2 sets of wireless infrared headphones, auxiliary audio/video jacks, remote game plug-in & mute button in overhead console, Wipers, intermittent, front wet-arm w/pulse washers, Windows, power-inc: driver express-down & lockout features, Universal Transmitter, HomeLink-inc: garage door opener, 3-channel programmable, Transmission, 4-speed automatic, electronically controlled w/overdrive & tow/haul mode, Traction control system, electronic, all-speed, Tow/haul mode selector, button located at end of shift lever, Tires, P265/70R17, all-season, blackwall. * Visit Us Today *Test drive this must-see, must-drive, must-own beauty today at Bleecker Chevrolet, 1200 E Cumberland St, Dunn, NC 28334.